Here we are back again at another Fab Friday Challenge! If this doesn't get your creative juice going for your weekend stamping projects I don't know what will! This time around we have a great sketch. You can't get more classic than a circle and a banner. My card idea came to me pretty quickly then I just had to sit down and punch out a bunch of branches. I made a ring use 2 different sizes of circle framelits and then adhered my branches around the ring, layering and layering until the ring was covered. The bird builder punch makes pretty quick work of the greenery. The small stars sprinkled across the card front are stamped in white craft ink. White craft ink is also sponged along the edges of the Kraft cardstock. I layered a Cherry Cobbler ribbon banner across the front. This ribbon is retired but any of our wider ribbons would be a great substitution. I left the ends hanging out from the sides of the card just to do something a bit differently. The wreath is popped up on dimensionals and has some small pearls clustered around to look a bit like mistletoe berries. The 'peace' was cut out of the old silver Glimmer paper using the Christmas Greetings thinlet set. I cut some itty bitty pieces of dimensionals to attach the peace to the wreath. The final detail are the little silver glimmer paper stars that were punched with the Stars border punch. I hope you'll head over to Fab Friday to see the rest of the goodies the Design Team has dreamed up and then play along with your own work of art! It's official, I've been bit by the Christmas bug. At least stamping-wise that is! Many of my projects lately have a Christmas or winter feel and today's Fab Friday challenge project is no different! We have a fun color combo this time! 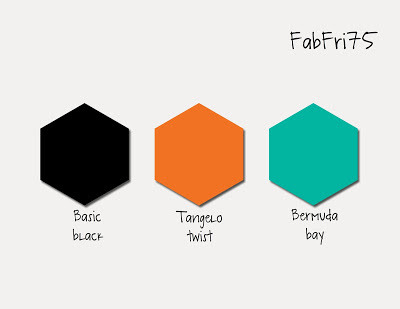 Tangelo Twist, Bermuda Bay & Basic Black! What possibilities do you see? I couldn't not get Christmas off my mind and after several failed attempts (if you saw my stamping desk you would say more than several!) I came up with this retro feel Christmas card. Orange is hard to work into Christmas! 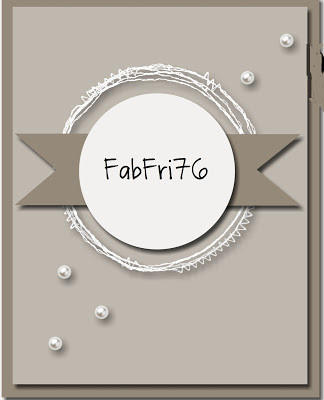 I hope you'll join us at Fab Friday to play along with this color challenge! It's always fun to try to make a seasonal card with a stamp set that isn't seasonal at all. So today I've got Stampin' Up! 's Garden in Bloom set to make a Christmas card! Cool right? I didn't even use the flower stamps but the butterflies! I simply stamped the butterfly twice, rotating it so the "petals" overlapped. Some I did full strength on both layers and others I just stamped again without reinking. The same with the leaves which are stamped in Old Olive. The background is fun too because is many of the stamps from the Oh, What Fun stamp set (it goes with the adorable tag kit!). I arranged them on a large clear block and then stamped them all at once filling up the card front. It's a very quick and easy way to make a background. I stamped the greeting (also from Oh, What Fun), cut a flag and attached it to the poinsettia panel with a retired gold brad. That whole piece is popped up on dimensionals. The centers of the flowers have Gold Glitz Dazzling Details in the centers. The red ribbon was from last year's Holiday Catalog and I had some leftover but you can easily switch it out for a current ribbon. This might be a very short post today as there is something screwy going on with my space bar. It's like I have to press it harder than normal and it's making typing very difficult. Is this the beginning of the end for this laptop?? I hope it's just crumbs or something stuck in there....Oh well. I'll carry on for the sake of stamping! I've been stamping quite a bit lately to participate in the Splitcoaststampers annual Hope You Can Cling To Challenge. Every day is a new challenge for the month of October to create cards to send to the MC Anderson Cancer Center in Texas to support cancer patients and their families. The challenges are really fun and for a great cause. I'm a few days behind as we were out of town this past weekend but I made this one last week. This challenge was called Lend A Hand. You were to use a hand image, trace your hand onto the card or apply color using your hands/fingers. I searched my stamp sets for a hand and didn't have one so I went with finger painting! I simply stamped this awesome flower in black ink and then colored in the flower by pressing my finger into the ink pad and then rubbing the color onto the image. You can see my finger prints a bit but I'm actually surprised with how well this technique looks. I hope you head over to Splitcoaststampers and join in the Hope You Can Cling To Challenge. It's a fantastic reason to toss aside the cleaning and laundry this month and make some cards! Nothing fancy with today's card but it does use an often overlooked supply. The Fancy Foil Designer vellum. I didn't buy it for a long time and then I used it at a demonstrator get together and was like why haven't I bought this yet? And one of my stamping ladies saw this card at class last week and was trying to find out what it was. I showed it to her in the catalog and and she said she never noticed it before! Well get yourself to page 149 in the Annual catalog to take a look. It comes in gold or silver, with 3 different patterns in each pack! A Pool Party card base with a layer of the striped Fancy Foil vellum over the top is a great backdrop to a strip with a row of candles. The Sprinkles of Life stamp set is not just a cupcake or tree set! I embossed the row of candles in black embossing powder and then colored them in with my Pumpkin Pie and Pool Party markers. I used my Gold Dazzling Details on the candle flames and added a punched sentiment with the Decorative Label punch. The last detail is the gold cord tied in a bow. The more I use the Among the Branches stamp set the more I'm loving it. It's nice to have a stamp set and coordinating embossing folder that covers 3 card giving occasions, especially when those 3 are so close together as Halloween, fall/Thanksgiving and Christmas. You can get your money's worth for sure especially get the bundle the includes the stamp set and Woodland embossing folder. We made this design last week at my monthly stamp club and I was joking that this card is the reason you put curtains on your windows. Those creepy eyes peeking out are enough to get your imagination going! And now I definitely need curtains for my front room....lol! The card base is Basic Black, then a layer of Rich Razzleberry and then a piece of Basic Gray embossed with the Woodland folder. We stamped the eyes and and crow in Basic Black, nestling them among the tree trunks. A small strip of the Black Glimmer paper and a Pumpkin Pie knot divide the card front. The "spooky" sentiment circle was stamped in Rich Razzleberry and cut out with the circles framelits (you can also use the 2" circle punch). We used a black marker to color in the eyes for some contrast and then popped it up with dimensionals. This would be a super quick and easy design to make if you needed to make Halloween party invitations or a smaller variation to make a tag for a treat bag. Still no fall color here but all the grass is really green from the rain we've had the last 7 days. I really couldn't tell you when I last saw the sun. I'll have to keep making cards with the Vintage Leaves stamp set until I can see the real thing. I used an old Freshly Made Sketches challenge for this layout. I like the soft colors and pulled my inspiration from a bedspread I saw in a catalog. The thing I like the most is the cute little acorn in the corner. I had to slap my hand away from adding the cute acorn and matching punch from my Holiday catalog preorder so I had to use what I had. I ended up using the smallest leaf die from the Leaflets framelits and cut one in Crumb Cake and then another in Soft Suede. I just cut the top off the Soft Suede one and added to to the Crumb Cake leaf. Looks pretty good huh? Excuse the terrible pic. Apparently my iPhone doesn't take fantastic photos like you see all over the internet!! I don't know where many of my readers are from but if you're on the East Coast it sounds like we all better get our waders out for the weekend! Boy is it going to be wet. Whether or not the hurricane will actually come near us is still not known but there is going to be a lot of rain regardless. I think things are starting to mold after this many days of wet, rainy weather. At least I won't feel guilty for hunkering down in my stamp room this weekend....what else are you supposed to do when the rain is coming down in inches at a time? 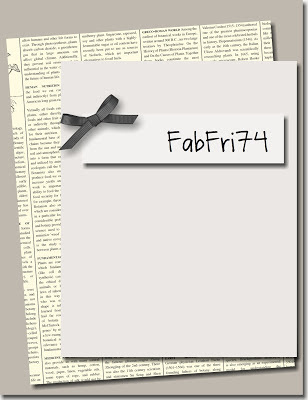 To give you a bit of inspiration and another reason to play with your stamps and cardstock we've got a new Fab Friday Challenge and this time it's a layout. What a great sketch right? The large top panel is just screaming for all of your creativity! Fill it up, leave it clean and simple I can't wait to see what you all do with it! I combined some old stamps, some new stamps, some Christmas items and some non-Christmas items, some current products and some retired ones. It's a hodge podge isn't it?? The card base is Crumb Cake and then a layer of Schoolhouse DSP in a nice Pool Party polka dot pattern. The layer with all the stamping is Whisper White with the tree from Sheltering Tree stamped in Crumb Cake. The ground is stamped in Pool Party stamped off once. That nice ground stamp is also from Sheltering Tree. The snowflakes stamp is from Among the Branches and is stamped in Pool Party and alternates between full strength ink and stamped off once. The ornament hanging from the tree branch is also from Among the Branches and was inked up with the Basic Gray and Cherry Cobbler markers. For the narrow panel element across the top of our sketch I decided to do my sentiment using the Red Foil paper and the Christmas Greetings thinlets. These thinlets are meant to pair with the Holly Jolly Greetings stamp set so I used the "Christmas" stamp from that set finish off my sentiment. I stamped it in Versamark on Crumb Cake cardstock and then embossed it with retired Pool party embossing powder. The Christmas and the whole image panel are both popped up with dimensional. I hope you'll join us in this Fab Friday challenge! You have 2 weeks so there is no excuse! We had a great time on Tuesday at my stamp club. I got to show all of my stamping ladies a lot of new Holiday catalog products and we made some cute cards. We made one fall card, one Halloween and a Christmas card. I'm totally going out of order as far as seasons go to show this one today but who cares right? The Sleigh Ride edgelits make such cute winter scenes. The delicate shapes are perfect for giving a little bit of color to make them pop against a darker background. The card base is Night of Navy and using the coordinating Jingle All the Way stamp set we stamped some snow in white craft ink. The 2 white layers are Shimmery White cardstock which is an often overlooked supply in the catalog. It has a nice light shimmer and takes ink differently than then smooth Whisper White so it works nicely for watercoloring. After cutting out the 2 layers we used ink pads and blender pens to color in the sleigh and tree (or trees). Real Red, Garden Green and Soft Suede were used for the coloring. A line of 2 way glue across the top edge of both layers and a bit of Dazzling Diamonds adds to the snowy sparkle of the card.